Niskin bottle files from my YouMagine page. I print using a Printrbot Simple Metal. You’ll also need a high strength elastic band, the exact type will vary depending on the final length of you bottle. I use a bisected 27 inch bicycle inner tube. Surgical tubing would also work well. And, of course, you’ll want a whole mess of zip ties and 1/4 paperclip. 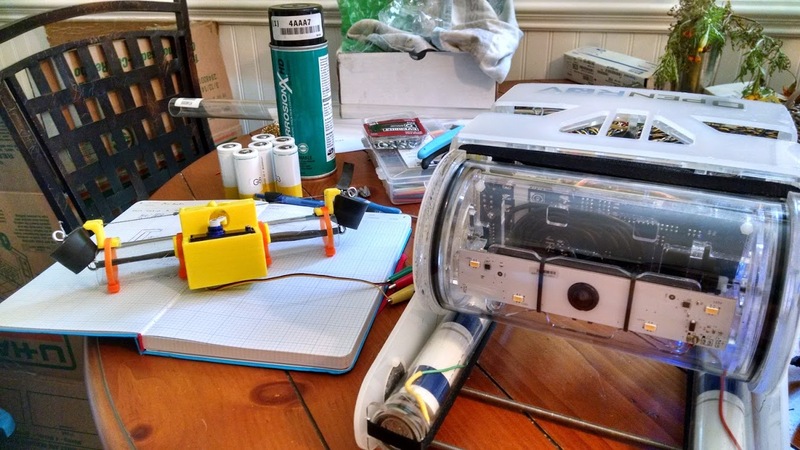 You will also need an OpenROV prototype underwater servo. These devices are still in the experimental phase, and I’ll be pushing a few to failure during the Blue Heron cruise. Print out all the parts. 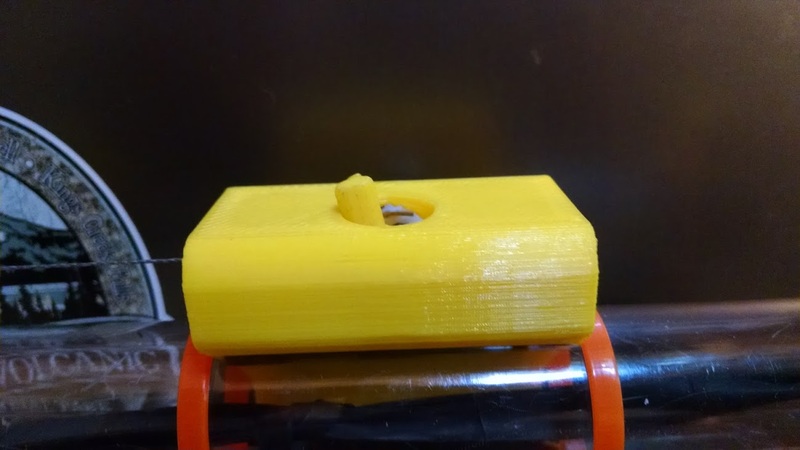 If you want to mount the bottle to the payload bay of an OpenROV, print the NiskinOpenROVClip.stl file. While everything is printing, screw the crown bolts into the rubber stoppers, on both ends. Cut the polycarbonate tube to desired length, debur, and chamfer the inner edges to prevent the stoppers from catching. Insert the servo into the trigger receiver such that the wires line up with the slot and hole. Mount the receiver to the center of the tube with zipties. Mount the end catches to the edges of the tube, making sure that they’re inline with the receiver. Tie off the elastic to one stopper and feed it through the tube. Tie off the elastic to the other stopper such that there’s enough tension to snap tight. Measure out enough fishing line that the stoppers are held open when the line is pulled to the center of the tube. Here’s the trick bit. One side of the receiver has a groove that allows the wire from the servo to slide in. Tie the pin to the rubber stopper on the non-wire-side of the receiver, there’s a small notch that indicates where the pin should be tied. Tie a big loop in the other line. Mount the trigger underneath the plastic arm of the servo with a paperclip. Lock the servo arm in place such that when fully extended trigger-side, the trigger rests tightly in the vertical slot in the middle of the receiver. You may have to power on the servo to determine where the fully extended position is. Wire up the servo to your control unit of choice. 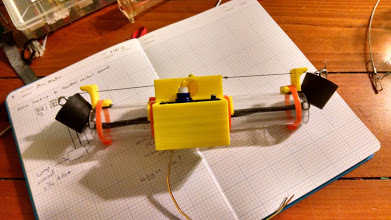 Walt Holm has some excellent advice for connecting to an OpenROV control board. 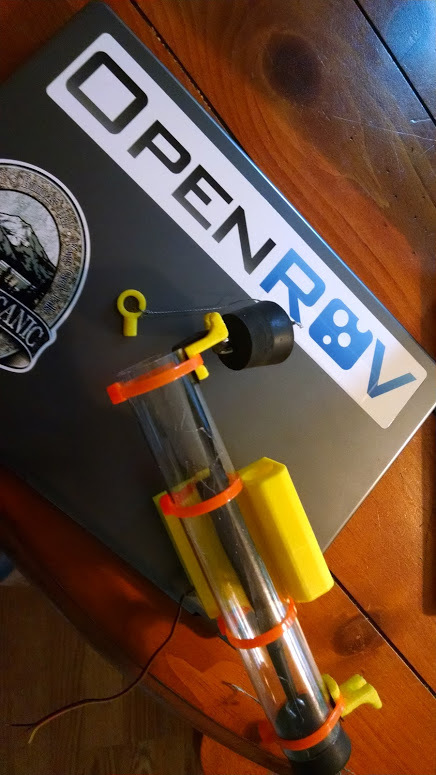 If you’re mounting to an OpenROV, mount the OpenROV clip to the front two bars of the payload bay and zip tie the bottle underneath. The finished, primed bottle should look like this. Using the catch for priming. Pull the pin-side rubber stopper up through the catch as shown. Slide the pin into the receiver and rotate until the post comes up through the center hole. Rotate the trigger into place. Pull the rubber stopper off the catch and place it in the open position. The pin should lock in place. Now open the other stopper, slide the loop through the receiver slot, and loop it over the post on the pin. The pin will catch, rotate, and lock against the opposite side of the center hole. This positioning ensures that when the trigger is released, both end will be freed simultaneously. The pin, locked in place. Using your controller of choice, activate the servo. Both stoppers should slam shut as soon as the trigger clears the pin. And that’s it. You are now able to take discrete water samples using an underwater robot, aerial drone, or hand cast. Feel free to modify these designs to suite whatever needs you have, though please respect the BY-NC-SA creative commons license. Go forth, and do good science! As in previous posts, you’ll notice that I’ve used Amazon affiliate links throughout. I get a small commission when you purchase something through those links, which goes towards server costs and other fees associated with running Southern Fried Science. If you decide to build your own Niskin Bottle, and happen to source your parts through Amazon, please consider using one of those links to help us out. Why poly-carbonate (instead of for example schedule 80 PVC), is it just availability on amazon? I wanted something clear so that I could see how everything was fitting together and moving while prototyping. You can use any material you need for the tube.